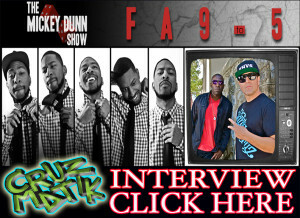 All the way from Baltimore (BMore MD) comes “THE MICKEY DUNN SHOW”…this is our 2nd time getting interviewed by Mr Dunn the last time was all the way back when we shot our 2nd music video “TODAY”…he wanted to see how we were doing & also wanted to know about our last video “GODZILLA” which he says is a hit!!! its crazy to see how much work have done together in just 2years time CLICK on the picture & listen in – S/O & THANKS 2 THE MICKEY DUNN SHOW always a pleasure PEACE !!!!! © 2017 Cruzmatik, All Rights Reserved. Website by Epik Design Co.